THE CONCEPT OF FOCUS HAS, over my lifetime (and, I’m sure in some of your own), moved through three distinct phases. The first, when I was very new to the making of pictures, was absolute. All or nothing. An image was either sharp from corner to corner, front to back, or it was worthless. My goals at this point all centered on technical mastery, I suspect because I had none. The second phase for how I viewed focus could be called front plane, rear plane as I got more adept at the selective use of depth-of-field, making decisions to sharpen either the tree in the front plane or the mountain in the rear plane. Here, I started to actually make deliberate choices on what to emphasize within a frame, and thus to prioritize the order in which I wanted people to discover my pictures. The third and most recent focal phase, one that could be called priorities within the plane, allows for even more controlled decision-making, as objects that are, from left to right, all the same general distance from the lens, rendered in vastly different degrees of sharpness as a matter of interpretation. This kind of selective focus is abetted by lenses like the Lensbaby line of products, many of which allow for the placement of a sharp “sweet spot” in-camera, anywhere within the image. Even more importantly, many remarkable apps allow for the same effect to be applied in post from a cel camera. The image at the top left is straight from my iPhone, with all objects across the plane registering in the same depth of field. The larger frame just overhead was rendered using the popular Hipstamatic app, which features a depth-of-field control that can be applied by the same tap-pinch move used by millions for nearly ten years. 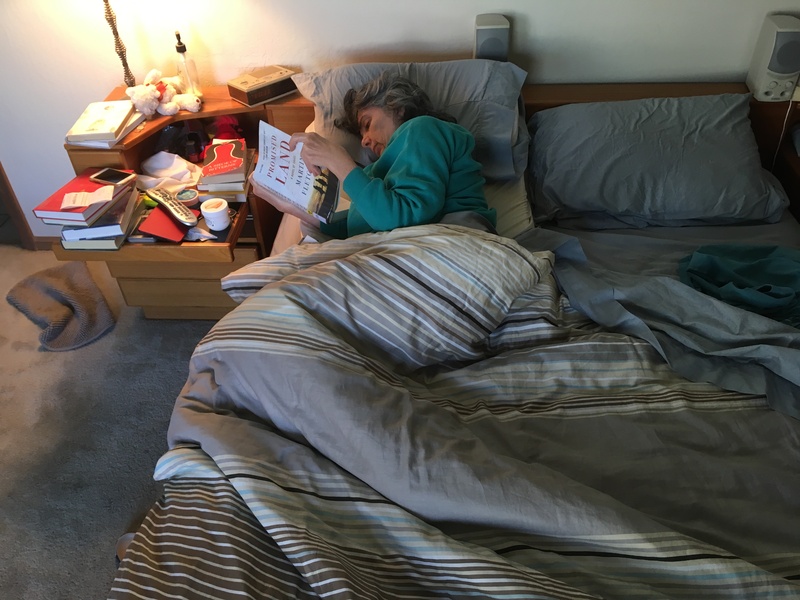 The effect of the doctored shot is to isolate the subject and her book from the general clutter of the room, suggesting a gauzy dream state as she settles into her chill mode. In inter-plane imagery, even a finished photograph can be re-interpreted endlessly, each “reading” as potentially powerful as a conventionally focused shot, proving, as the best photography always does, that images benefit most from an open approach. Years after I snapped my first shutter, I try to see myself as being on a journey. Every time I think I’ve arrived at a destination, it’s time to stick out my thumb again. This entry was posted on November 4, 2018 by Michael Perkins. It was filed under celphone cameras, Conception, Depth Of Field, Uncategorized and was tagged with Hipstamatic, Lensbaby, Selective focus.